On completion of your order, please send a rough version (description and/or image) of what you require to us via email. Colour contrast makes for a very visual poker chip! Tri-Gen Numbered Poker Chips are a clay style composite chip. 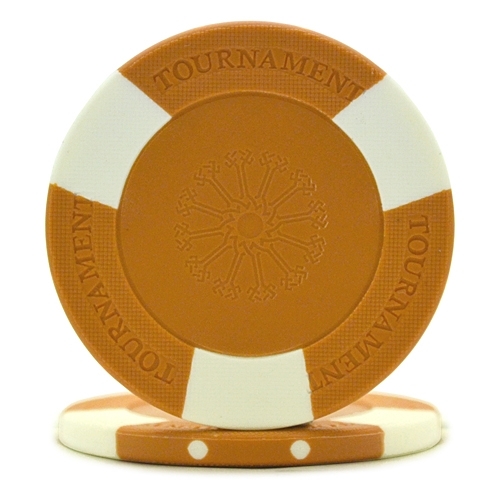 They are constructed in 2 contrasting colours with a textured finish, the word 'tournament' embossed and numbered inserts in a recess both sides of the chips. Tri-Gen numbered poker chips weigh in at 12.5g. Tri-Gen poker chip contrasting colours make for a very visual poker chip. We are currently promoting a FREE Gift on all orders over £40 to any location around the world. Simply ensure your basket total is over £40 excluding any P+P and we will send you a 'No-Limit Texas Hold'Em for Winners' worth £12.99 for free! We are currently promoting Free UK Mainland Standard Delivery on orders over £50. (Next Day Orders, Custom Products which require production and Trade Orders are exempt for this promotion). If you are unsure of any details please Contact Us and a member of our sales team will answer any questions and help to place your order. We use a variety of couriers for our deliveries depending on the weight, size and speed of delivery required. We use Royal Mail for standard light mail and small parcels, DPD Local for the majority of our medium & large sized parcels, DPD International and Fedex for International orders. Our DPD Local service also provides you with a 1 Hour delivery window via SMS or email which then turns into a Follow My Parcel service which enables receivers to watch the progress of their delivery on a real-time map, all the way down to a final 15 minute time-slot. No more having to wait in all day!! Click here to view some video details. We offer Next Working Day, Before Noon and Before 10.30AM Delivery Services (on most items) which guarantees shipment with DPD Local for a next working day tracked and recorded (signed for) delivery. Orders received Monday - Thursday before 2.00pm will be delivered Next Working Day. Orders received Friday before 2.00pm will be delivered on Monday (except Bank Holidays, delivery will be Tuesday). Orders received after 2.00pm Friday, all of Saturday & Sunday will be delivered on Tuesday. Public and Bank holidays are not included as a working day.